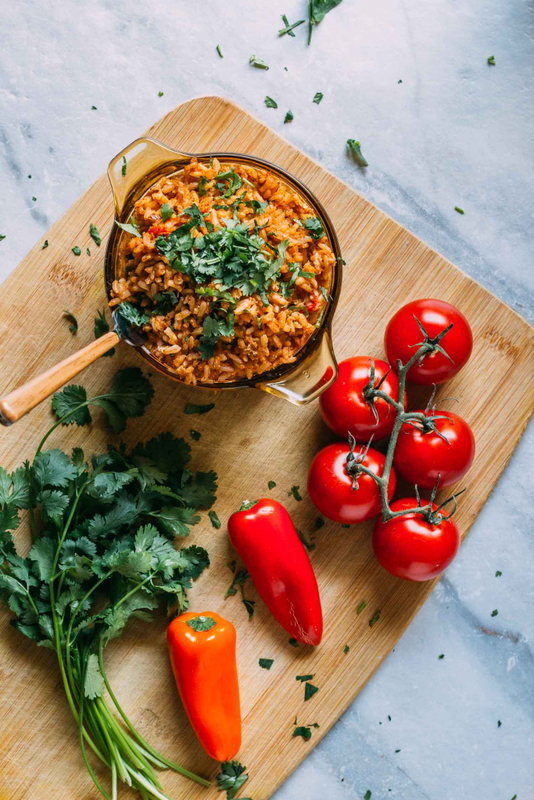 What if we told you that our delicious 1-Pot Enchilada Lentil Rice recipe practically happened by accident? It’s true! And kudos to all of you who spend a minute or two in the kitchen trying to see what works. Sometimes, those creative ventures produce fabulous results! Anyhow, maybe this is what they mean by a “happy accident.” This deliciously simple meal definitely dishes out the joy! The savoriness of our gluten-free enchilada sauce covers the rice like a warm hug. And the tiniest bit of heat from the fresh seeded jalapeno packs precisely the amount of punch that you like. Just add as much or as little spice as you want! 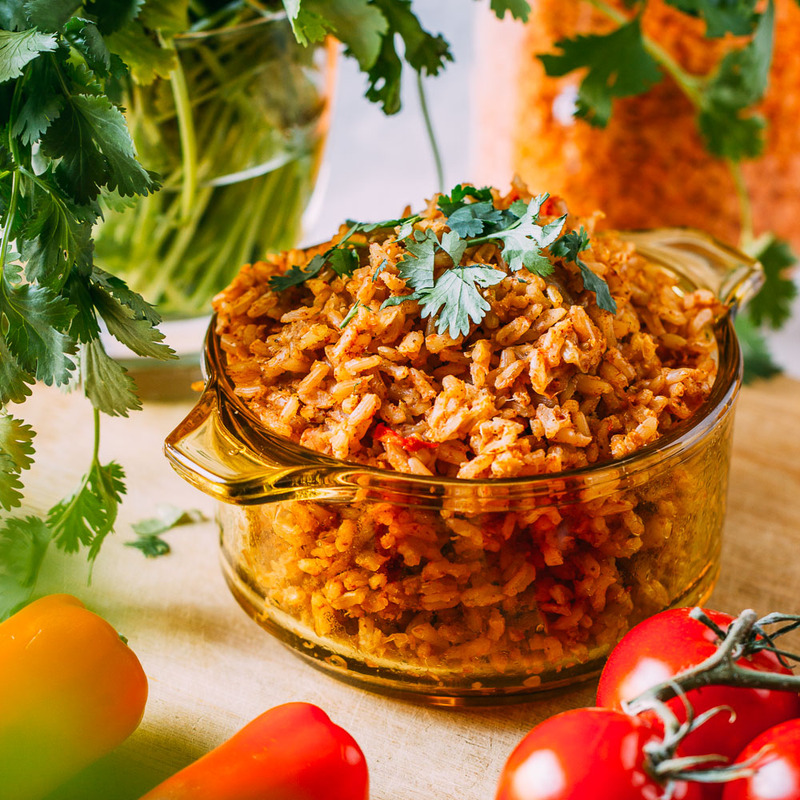 One of our favorite things about 1-Pot Enchilada Lentil Rice is how easy it is to prepare. Given that this lovely little dish started out by accident, the idea that it’s easy to make makes sense. And in our humble opinion, cooking a complete dinner in 1-Pot is downright desirable. One alternative preparation method we’d like to mention is the idea of soaking your rice before cooking. If you look through a Middle Eastern cookbook, you’ll notice instructions to rinse and soak rice before cooking. But is all of that soaking and rinsing necessary? From what we have gathered in our vegan cooking adventures so far, most long grain rice does not have to be soaked. However, some types of imported rice and basmati rice do genuinely need to be soaked before cooking. Soaking time for those particular varieties of rice separates the grains and creates a more fluffy, and less sticky, rice. Soaking is said to aide with the digestibility of the grain. Rinsing and soaking are said to reduce levels of arsenic. Soaking is said to produce less sticky and fluffier rice. It is also believed that soaking rice improves taste. So, we choose to soak our basmati rice for a handful of hours in cold water before cooking. We soak for long periods when we plan ahead and less when deciding to cook rice at the last minute. We’ve found that soaking makes a big difference in texture and taste. So, whenever possible, we allow time for our rice grains to enjoy a little soak. And we’re also rather fond of the idea of ridding our rice of pesticides. We also choose to buy organic rice whenever possble. If you would like to read more about the benefits of soaking rice grains to reduce arsenic commonly found in rice, read this article. So how did such a tasty recipe come about by accident? Well, we’d been rushing around doing some office redecorating and reorganizing, and we needed something nourishing, fast! 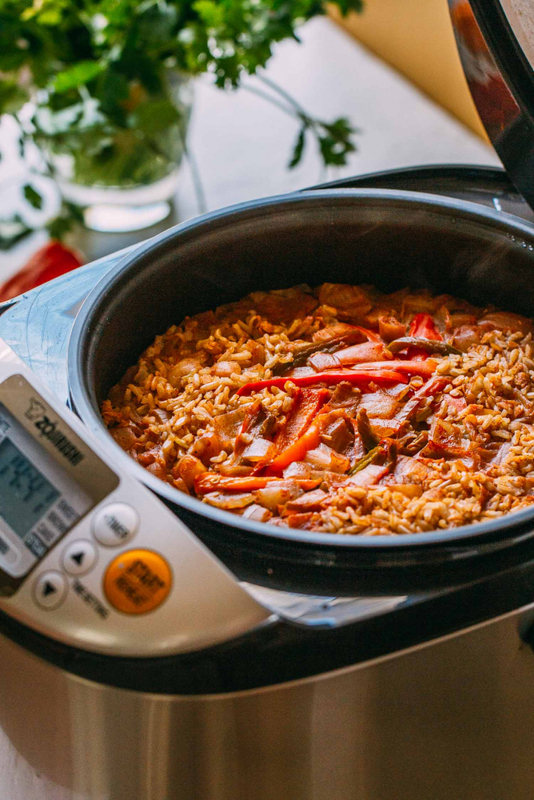 We had this new nifty Instant Pot we’d hardly touched, and we thought, why not give it a whirl at rice? When we talked flavors of rice, we thought of how we missed our Grandma DeLeon’s rice. To make it srystal clear her rice is the kind of side that makes everyone eat “just one more” taco. Anyhow, we wanted to amp up the nutrients a bit by making the rice eat more like a meal than a side. One thing led to another and “BAM” (Thanks, Emerille) before we knew it, lentils were in the pot! And as for Grandma’s flavors, we remembered how she often chose to make something she called “Enchilada Casserole” whenever she wanted to make meal prep a little easier. So, in went the canned enchilada sauce. Remember, we were in a hurry, busy and tired! Before we knew it, the house smelled terrific and eventually, (HA!) the Instant Pot pressure valve dropped and some piping-hot and fabulous 1-Pot Enchilada Lentil Rice we enjoyed! In addition to thanking Grandma DeLeon for her inspiration when it comes to creating wonderful latino flavors, we want to make mention of Forks Over Knives magazine. A terrific recipe in Forks Over Knives magazine served as inspiration for our version of no-cook enchilada sauce. They shared a method called, “10-Minute Enchilada Sauce.” By the way, we highly recommend picking up the latest issue! If you have something nice to share about your experience with our recipe, leave a comment! 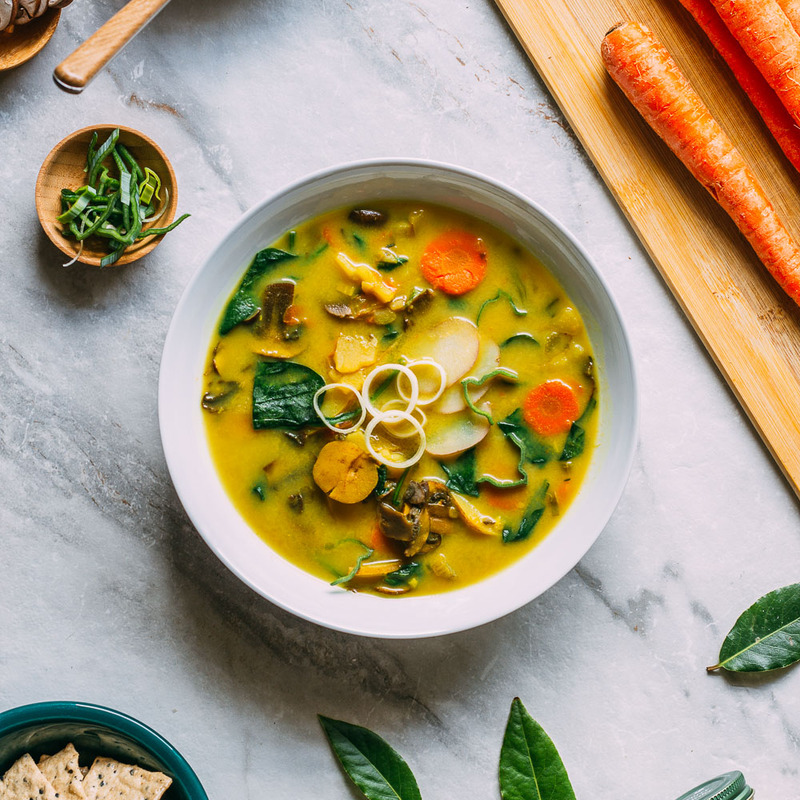 Comments support our blogging efforts to share this healthier way of eating and also helps us all have a chance to feel those terrific, compassionate, veggie-loving vibes. 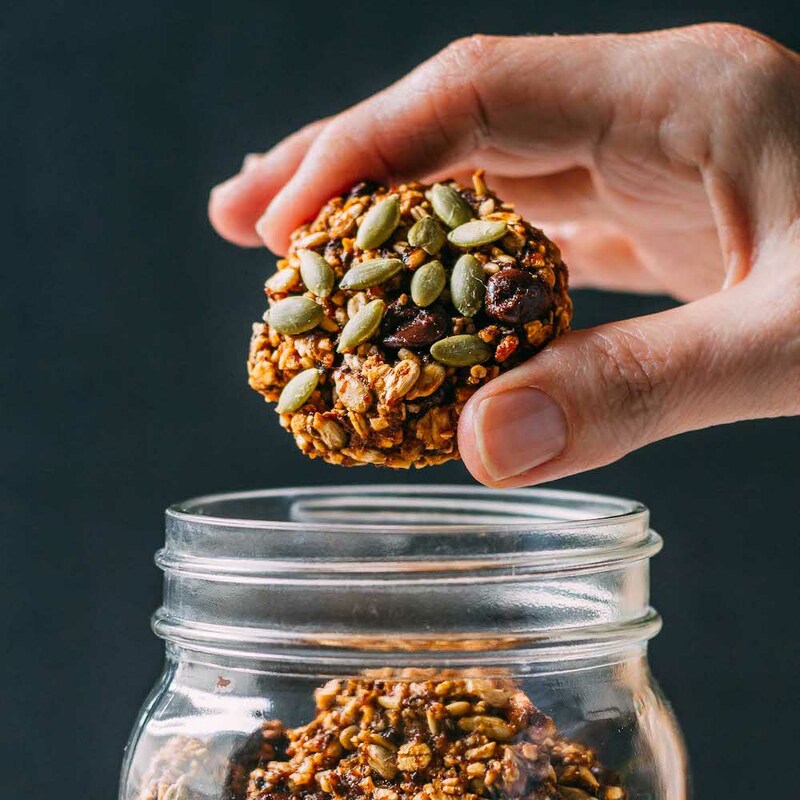 When folks become curious about a plant-based way of eating, they read comments to help them decide to give recipes a try. So, thank you ahead of time for your thoughtful words. 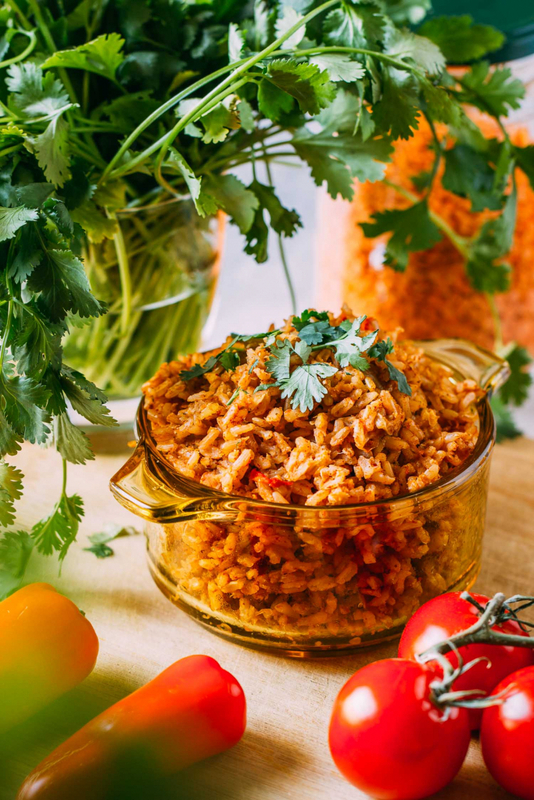 Our 1-Pot Enchilada Lentil Rice helps you bring deliciously homey and inviting flavors to the table with minimal effort. With all of the ingredients thrown into one pot and prepared either on the stovetop, in a rice cooker or a pressure cooker or Instant Pot, it’s a perfect busy-day meal. 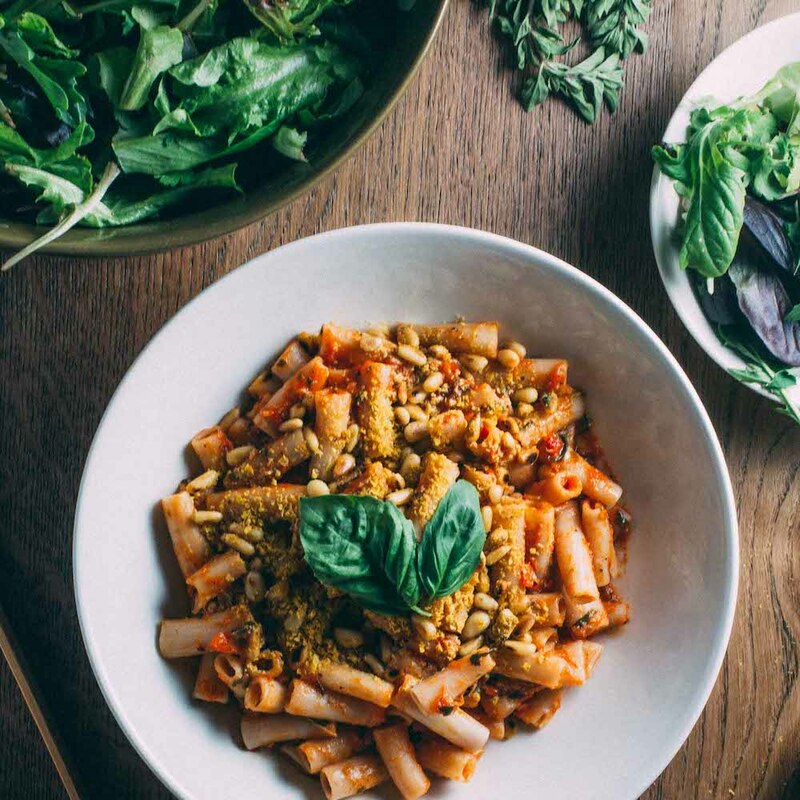 Gluten-free, plant-based, vegan, and one-hundred percent refined oil-free, nut-free, and soy-free, this is a meal that’s sure to please everybody at your table. And as for the leftovers, well, this lentil and rice dish tastes fabulous the second time around. That’s why we were sure to create this recipe to provide plenty of servings; you’re going to want there to be leftovers! Serve 1-Pot Enchilada Lentil Rice on a bed of spring greens or spinach or nestled inside half of an avocado. about 4 cups of brown basmati rice or another rice, rinsed and soaked a while when time allows - We use this organic variety of basmati. a generous dash of pink Himalayan salt or another salt - We like to purchase this brand in bulk for the best deal per pound. one 15-oz can of tomatoes blended into a sauce or use tomato sauce - We use this organic brand of fire roasted tomatoes, but any variety will do. 5 tsp of chili powder or 4 1/2 tsp of ancho chili powder - We use this seasoning often and purchase this organic brand in bulk. 1 tsp of paprika - As soon as we need to refill our paprika jars we're trying this organic brand! Place all of the ingredients into a rice cooker or Instant Pot and follow the instructions for your brand of pressure cooking appliance for preparing brown rice or whatever type of rice you are using. We made a batch in our Instant Pot on the rice setting which we set for 15 minutes. If you are familiar with Instant Pots or another such device, you know that a 15-minute time setting for a pressure cooker does not mean that the rice finishes in that short amount of time. For stovetop cooking, cook as you would any rice dish according to the type of rice you are using. In other words, follow the cooking time and method according to the instructions on the rice packaging. The split red lentils are so small that they will cook right along with the rice. When we made this dish using a rice cooker, we set ours for "mixed-rice" since we include lentils in the recipe. If your rice cooker doesn't have a mixed-rice setting, we suggest you set it according to the type of rice you decide to use for this dish. On a side note, we love this rice cooker and use it nearly every day. When serving, top with a sprinkle of fresh cilantro, an optional dollop of plant-based vegan sour cream or fresh salsa along with a lite dusting of pink Himalayan sea salt. Additional jalapenos also make an excellent topping for those who like things spicy! 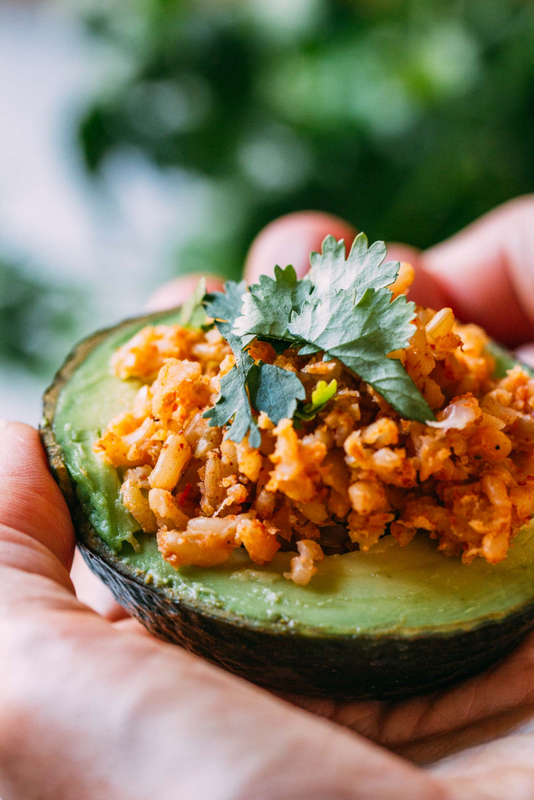 Oh, and you have to try 1-Pot Enchilada Lentil Rice snuggled inside half of an avocado. If you are in a super big hurry, you might opt to skip making the sauce portion of this recipe by using a 14-oz can of prepared enchilada sauce. If taking this route, add enough additional water to the canned sauce to make the sauce portion of this recipe equal to about 2 cups. FYI: that's actually how we first came up with this dish! To turn the enchilada sauce portion of this recipe into a sauce to use in other dishes you will likely want to add about two cups of veggie broth or water to the ingredients. You might simmer it on the stove to help the seasonings come to life and allow everything to reduce a bit to thicken the sauce. Season with salt as needed. If you're making a batch of sauce ahead, it should keep well in the fridge for about a week in an airtight container, such as a mason jar. We use these jars for everything! We've also used Indonesian Volcano rice in this recipe and enjoyed the results. Varying the type of rice, you use from time to time provides a variety of beneficial nutrients. We keep this six-pack in our pantry for when we crave a change. When you make this recipe using our quick and easy no-cook enchilada sauce, you'll note that we call for miso. We like to use miso as a savory flavoring in place of salt when the recipe allows. According to this video, miso as a seasoning is more healthily received by the stomach than straight salt. I feel lucky to have embarked on this journey and then fall upon your hard work. I just made this. I had all of the ingredients except hot peppers. I left them out. I cut the rice /lentil amount in half but made the full sauce recipe and only used half . I froze the other half of the sauce. Now I need to learn how to make my own wraps! First of all, thank you for the recipe love, Cindy. And next, thank you for sharing your experience of using half the rice and still making the full recipe for the sauce and saving half for another use. Finally, your words read like poetry and warmed my heart. I’m grateful. Oh, and yes, that makes two of us regarding needing to come up with a wrap! Do you just throw the enchilada sauce ingredients in with all the other ingredients (but then I don’t think you would call it a sauce, right? ), or do you have to make the sauce separately somehow? Just combine in a bowl? Mix in a food processor or blender? Thanks for asking, Marissa. We’ve prepared it both ways, mixing the sauce beforehand and just throwing everything in the pot and both methods work out equally well!